Whether it be liberal politics or liberal religion, a favorite trick of the liberal is to re-define a practice or doctrine with a new name that casts it in a negative light. For example, the exclusivity of Christ (clearly taught in Scripture) is labeled as “intolerance” and is vilified. I suggest that we as Christians should begin to use the same tactic. From here forward the word “abortion” should be dropped from our vocabulary. The new word we should insist on using should be “sacrifice“. Example of new terminology in a sentence: I had a long talk with Bob the other day. After his son Todd got that girl pregnant, he convinced her to go downtown and offer a sacrifice to bring blessings of prosperity on their future. Sound crazy? It shouldn’t. As opposed to the liberals habit of re-definition to distort true meaning, this re-definition actually clarifies and more accurately defines the concept. Abortion is nothing more than killing a human being in hopes of gaining freedom, financial health and increased convenience. This is the exact same practice of human sacrifice found in the Old Testament and other ancient literature. 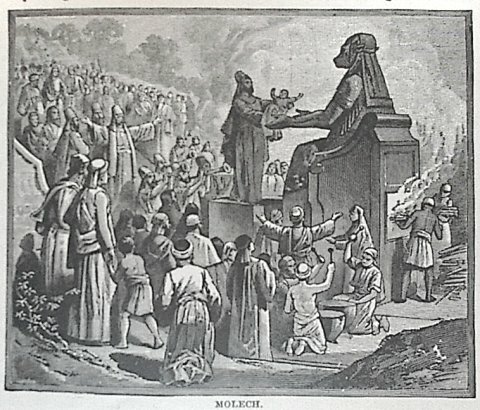 Thinking their gods would bless them with peace and prosperity, religious followers would put their infant children in fire as a sacrifice. In these modern times the actual killing is dismemberment, done out of site (in the womb), but does that make it any less painful or barbaric? No. And it is done for the same reasons now as it was then. The only difference is that those in ancient times killing their children had the intellectual honesty to admit what they were doing and why. So let us re-define the practice abortion. From this time forward we will use the term “sacrifice” instead. Perhaps it will catch on and bring some clarity to the discussion as to whether or not it is acceptable to slaughter children for personal gain. When any topic like this is discussed, it should also be noted that there is forgiveness of sins, all sins, through Christ. If you, the reader, found this post painful to read because you had an abortion or encouraged an abortion in the past, there is mercy at the feet of Christ for even this sin. Was it a horrible, horrible offense? Yes. But Christ offers forgiveness through His work on the Cross for this sin as well as all the others. You are not beyond His ability to redeem! Repent and call out to Him today!